The month of February may as well be renamed Sustainability month on the Oregon State Campus. Recycle Mania and Campus Conservation Nationals are both national sustainability focused campus wide competitions that take place and overlap during the month of February. In addition to the campus versus campus competition, both have residence hall competitions. To capitalize on all of the sustainability focused thinking during this time, the West Hall Eco-Taskforce decided to take things one step further and create a competition between the floors in our hall. Eco Event Month was created to highlight and add to all of sustainability information being shared during February. 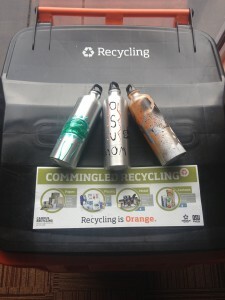 Eco Event Month was structured to include four weeks each with an eco-theme and four events per week. Every week had a documentary showing, a jeopardy game, and two other events based upon that week’s theme. Examples of these events include metal reusable water bottle decorating, water taste testing, and a compost program scavenger hunt. Attendance at events earned the individuals a point and a point for their respective floor. An eco-basket full of sustainable prizes was given to the individual with the most points at the end of the four weeks, and the floor with the most cumulative points will be given a pizza party and money to donate to a sustainability focused charity or non-profit. This competition was meant to be a fun and interactive way to combine the efforts of Recycle Mania and Campus Conservation Nationals and overall it was very successful. Setting up the competition is quite simple and fun event ideas can be easily found, so if you like our idea maybe think about setting up your own Eco Event Month next year, or even better adjust it to work along side Earth Week in April!